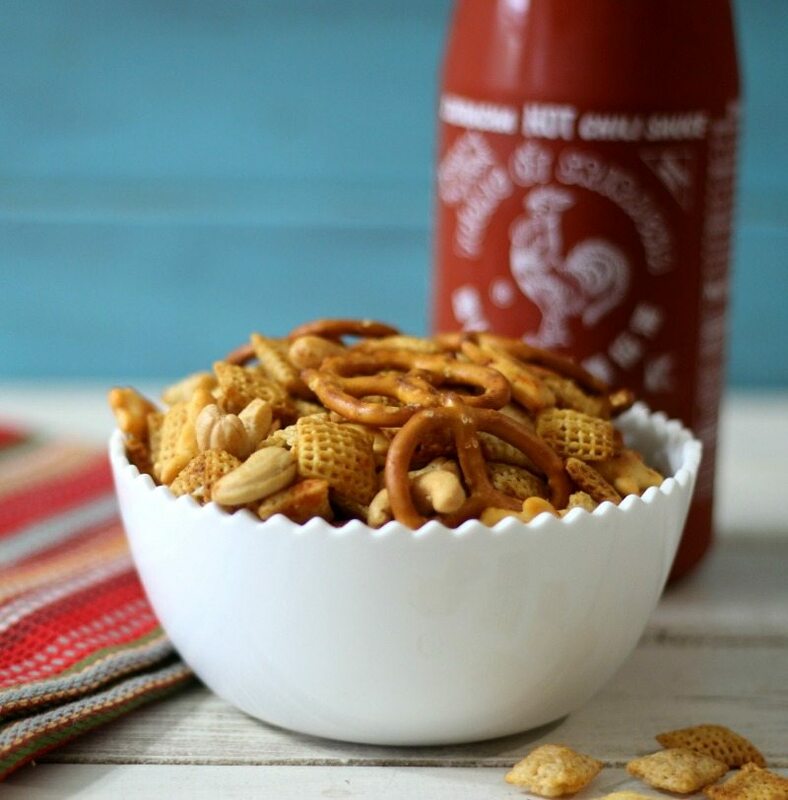 A few weeks ago I made Sriracha Chex Mix. Let me tell you it was hot, beyond hot. I walked into my co-workers office and it looked like she was crying. Her face was red, watery eyes and runny nose. I asked her if she was ok, and she smiled and said yes, I just ate some of your Sriracha Chex Mix. Oh geez, that stuff was hot. She said she loved the flavor and couldn’t get enough of it. Well needless to say, it must have been a hit because it was all gone within a week. I liked it, but me, who loves spicy could only handle so much of it. I told my co-worker that I was making it again this weekend, but cutting down on the Sriracha sauce, she smiled, and said she can’t wait. She told me she got zippys when I told her. You know what zippy’s are? I call it that weird feeling you get in your cheeks when your going to eat something great. So today I am sharing with you a re-make of my recipe that is not quite so hot, but has amazing flavor. 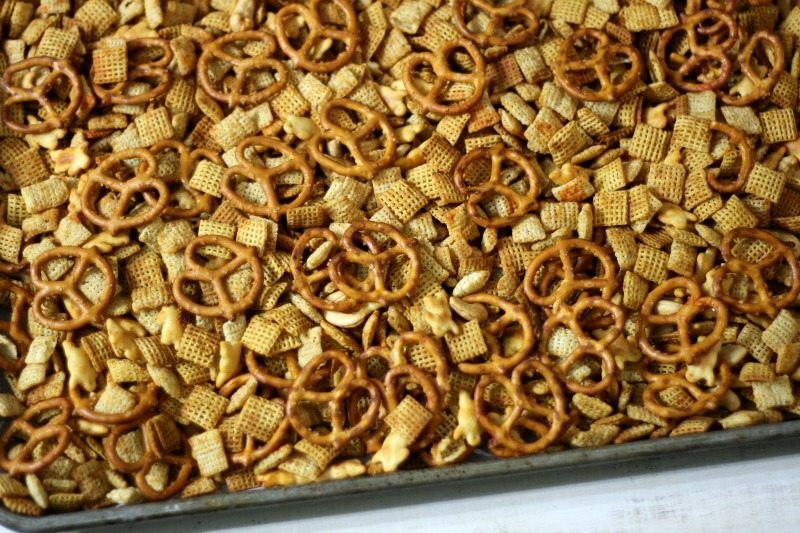 This Chex Mix is so yummy. It’s slightly spicy, crunchy and the perfect snack. The heat comes at the end of each bite. Not sure how it does that? What also gives this Chex Mix a great flavor is the sauce is made with low sodium soy sauce, garlic powder and sesame oil. I love the sesame oil in it. When baking it, it smells like your making Chinese food. Making it is a breeze. 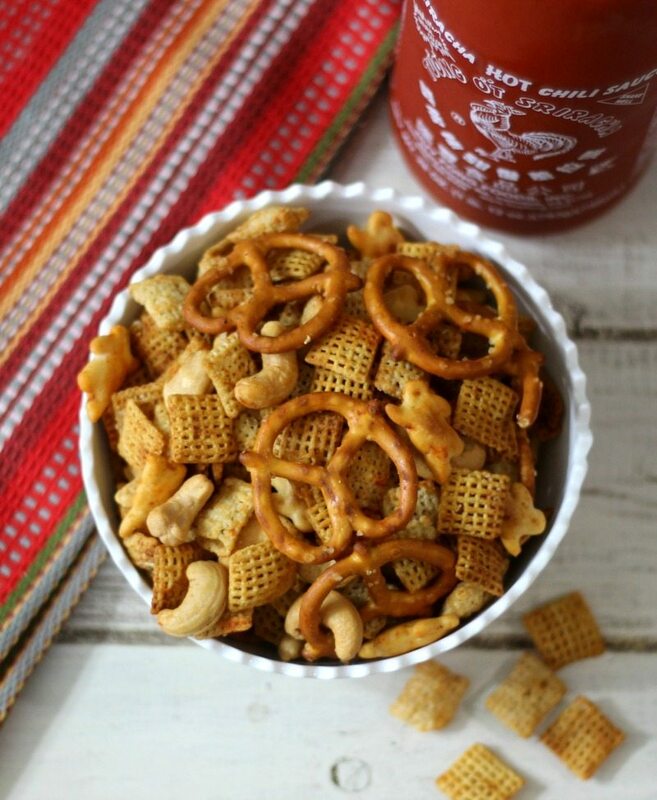 I took a HUGE bowl and added Chex Mix Cereal, you can use any kind you like. I mixed it up with Rice Chex and Corn Chex. I love Corn Chex, I eat it dry as a snack in the evening. I also add Rold Gold Pretzel Twists, cashews and Annie’s White Cheddar Bunnies. I’m addicted to the White Cheddar Bunnies and is a great compliment to the mix. You can also use Cheeze-It’s if you like. Then in a Pyrex Measuring cup I melted the butter and mixed in the wet ingredients. Poured it over the Chex mixture and stirred, stirred and stirred it together until everything was coated. I poured it into a baking pan that was covered with parchment paper. Bake at 250 degrees for 1 hour, flipping every 15 minutes. That’s it. This recipe makes twenty-one 3/4 cup servings. It makes a lot and perfect for sharing. 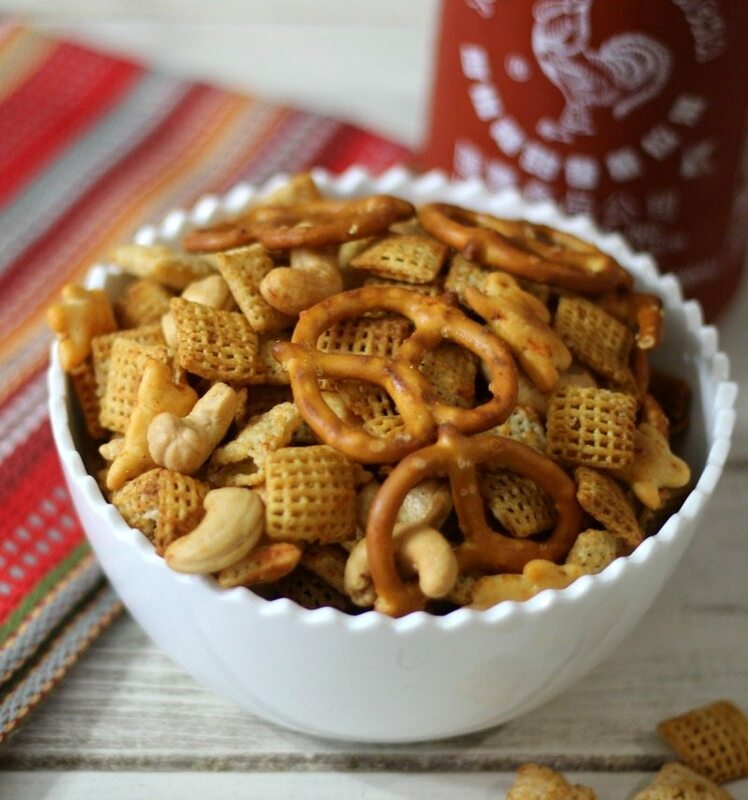 A slightly spicy Chinese flavored snack mix made with Chex Cereal, cashews, pretzels and cheddar bunnies. Perfect for snacking. In a LARGE bowl add all of the dry ingredients. In a Pyrex measuring cup or microwave safe bowl, add butter and melt for 30 second increments, until melted. Mix in Sriracha Hot Sauce, soy sauce, garlic powder and sesame oil. Pour over cereal mixture. Mix until well combined. Be careful not to break the cereal and pretzels. Pour onto prepared baking sheet. Bake in oven for 1 hour; flipping every 15 minutes. Cool completely and place in a sealed container. I place it in a zip-lock bag. Good for a couple of weeks. 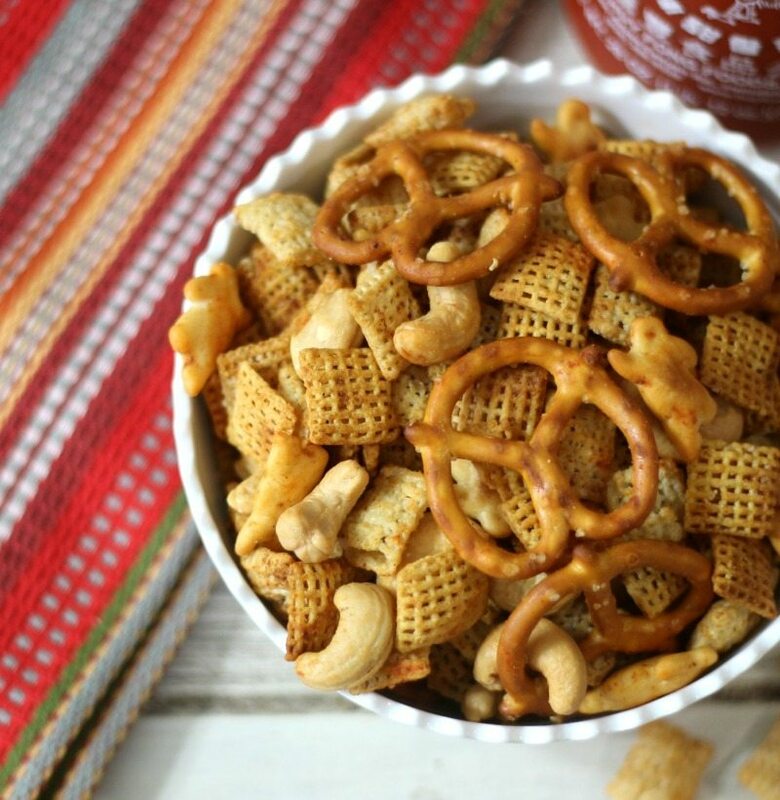 Use any combination of Chex Mix Cereal you like. As long as it adds up to 9 cups. Yum, yum, yum! I am excited to take this to work. Oh, I store it in a sealed container at room temperature for up to two weeks. I actually use a Ziplock bag. It works perfect and easy for transporting.